Since 1915, The Forest Preserves of Cook County has been protecting and restoring land , but preserving nature is only half of the story. The other half is written by you, and how you choose to explore and connect with your preserves. 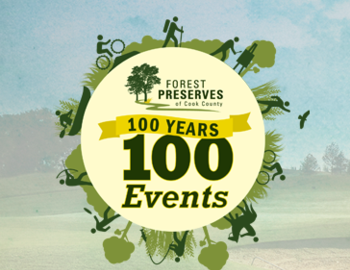 The Forest Preserve Golf Courses are celebrating 100 years of conservation efforts of The Forest Preserves of Cook County by offering a golf special on Friday, September 25th. We are always happy to offer an opportunity for our guests to have an enjoyable round as well as enjoying the environment the Forest Preserves of Cook County has created around the golf courses.